A transport company operating out of Western Australia has been fined $31,000 for breaches relating to the transport of dangerous goods. A total of 14 separate offences were charged against the company, including failure to placard, carry required documentation and safety equipment. 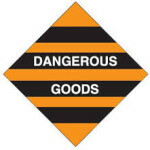 More information can be found at:http://www.miningaustralia.com.au/news/trucking-company-fined-31-000-for-dangerous-goods. This continues to reinforce the focus authorities in Western Australia are taking towards ensuring transporters of dangerous goods abide with the law at all times.